With school back in session and fall quickly approaching, my mind tends to meander to what looms ahead in the foggy future: The Season of Sniffles. Each year, it seems to hit our household with a vengeance and we have red, runny noses for months on end. If I’m lucky, we can get through the bouts with minimal detours to our daily schedule, but sometimes the cold brings its trusty companion: the dreaded stomach flu. I’ve learned over the years that keeping the raw noses and tender tooshies as protected as possible, not only keeps complaints at bay, but is better for the well-being of my kiddos. You see, when you have to ask your child to blow their nose just one more time, it’s nice to have a fluffy, dependable assistant. There is nothing worse than a crying child who is more fearful of the imminent wiping than of the act that got her there! We all know the not-so-fresh feeling of having to use a rough tissue that irritates the delicate areas of our already-overwhelmed, sick bodies. That’s why Angel Soft‘s durability and quilted softness are ideal for ensuring that everyone in my house can rely on a soothing touch when needed. 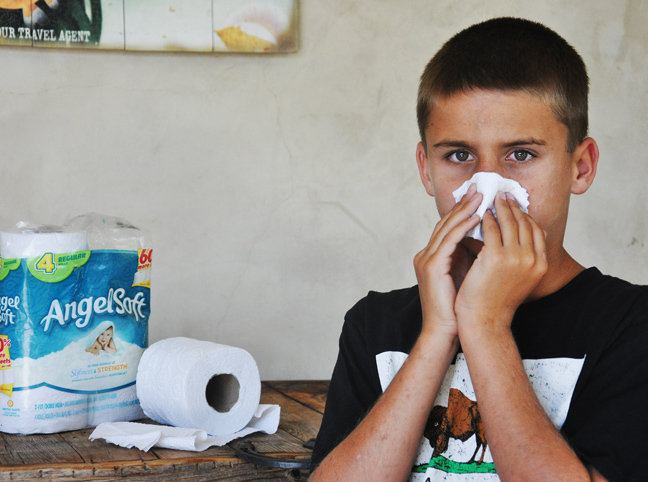 For the sniffles, we have come to realize how much easier it is to keep a roll of Angel Soft in the console of our car, than to try to fumble around with a more expensive, awkward box of tissue. It’s easy for me to toss a roll to my kids in the backseat, so they can tear off a few squares and blow their sniffly noses. We’ve also discovered that we can use Angel Soft for a smooth, quick face wipe to erase any toothpaste residue on the kids’ mouths I didn’t notice in the morning rush to get out the door. Angel Soft’s budget-friendly value allows me to be a little more relaxed when I let them use the roll on their own too. With the reliable 2-ply combination, we never need to worry if the tissue will do the job it’s called to do. No waste here! What a bargain!